Thanks to a chance meeting 20 years ago with one of her father's former colleagues, Baird, daughter of Perry Baird a Harvard-educated mid-20th-century physician of some renown who was locked away and never spoken of as he succumbed to the ravages of mental illness gets the keys to unlocking the mystery of what happened to her father. Perry Baird was diagnosed with manic depression in the 1930s at a time when doctors had little comprehension of the disease and employed shockingly barbaric and useless "cures" such as straitjackets, isolation, and lobotomies on institutionalized patients. Perry Baird was a pioneer in attempting to understand the workings of manic depression, conducting lab experiments to find the biochemical cause as the illness steadily took hold of him. His daughter, who saw him only once after he'd been sent to a mental hospital when she was still a young child aided by the unearthed manuscript her father had written while committed that she pieces together and includes seeks to unravel the heartbreaking circumstances of what befell her father for all those decades when her family refused to talk about him. She is the one who rediscovers her father's experiments and gets him the long overdue credit from the scientific community he deserved. 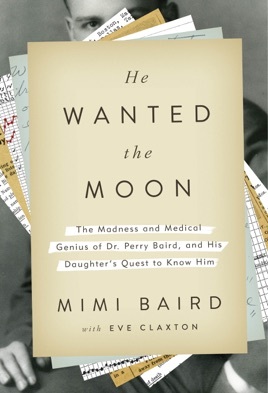 In bringing her father's harrowing, tragic, and moving story to life, Mimi Baird celebrates him and gives voice to the terrible suffering the mentally ill once endured, and still do today, and challenges the prejudices and misperceptions the public continues to have about the disease. I have manic depression. Despite the highs, the lows and a couple of stays in a hospital, I lead a pretty normal life. It is hard to imagine how mental illness and it’s treatments were dealt with over 50 years ago. I am glad you were able to reconstruct his life. He would have been very proud of your effort ! !